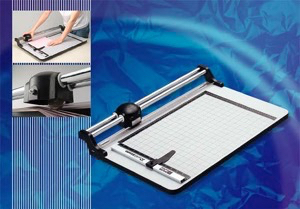 A good paper cutter is a must have a device for any print shop or office. There is always going to be times when you need to just cut one sheet, a couple of sheets, or stacks of paper. You can choose from manual, rotary, electric, or hydraulic paper cutters. Scissors and knives alone will not get the job done, you will need a paper cutter. What are you cutting at the office? Yes, I know someone has to cut the cake for the secretary’s birthday, but that’s not what I mean. It seems we all end up doing some sort of paper crafts once and a while. Trimming down those photos for the traveling exhibit, cutting out stacks of pamphlets to fill the marketing rack in the reception area, slicing up that spreadsheet that mistakenly printed on the ginormous paper in the bottom drawer. Every office needs a paper cutter, the only question is, which one? Paper cutters basically come in two flavors these days – Guillotine and Rotary. To figure out what you need, you need to consider volume and speed. But, you also need to take into consideration the safety of your staff and how accurate cuts need to be. 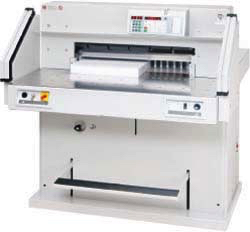 Guillotine paper cutters are commonly found in offices. They’re sharp, can cut through multiple sheets with ease, and there are some great measurement guides on the working surface. Multiple sheets at a time speak to the volume necessity, but often works against accuracy. The clamps and lockable gauges of the Kutrimmer tabletop paper cutter trimmer assist with accuracy, but its most impressive additions are safety features. Different models of guillotine cutters basically allow for larger sheets and more working space. In addition to manual cutters, you will also find Guillotine cutters can be electric or hydraulic cutting stacks of paper at a time. In addition, all the new larger cutters can be programmed for common cuts you may be doing. This cuts down on production time and also helps with using low-skilled workers to complete the tasks that would have required some skill to complete. The most accurate cuts will always be made with Rotary cutters. My personal fav is sold at Lloyd’s. The Roll-Blade rotary trimmer not only has great measurement guides and a self-sharpening tungsten blade, but it also cuts through cardboard and some plastic with just as much accuracy as it does with paper. And, unless you’re really trying, it’s virtually impossible to cut yourself with this rotary. 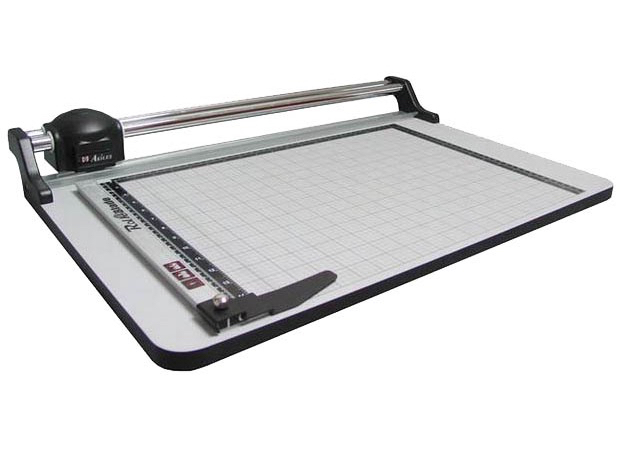 A good paper cutter can help you tackle any jobs that customers throw at you.